The last time Australia had a recession, the Clintons had never run for president, Donald Trump had never had a business go bankrupt, and the Soviet Union was still a country. In other words, it's been awhile. Twenty-five years, to be exact. That's not quite a record — the Netherlands didn't have one between 1981 and 2008 — but it's close. That doesn't mean, though, that Australia's unemployment rate hasn't had its ups and downs during this time. It has. It's just that when it has risen, as it did in 1996, 2001, 2009, and most recently 2013, it hasn't risen that much because its economy has gotten back to growing almost immediately. 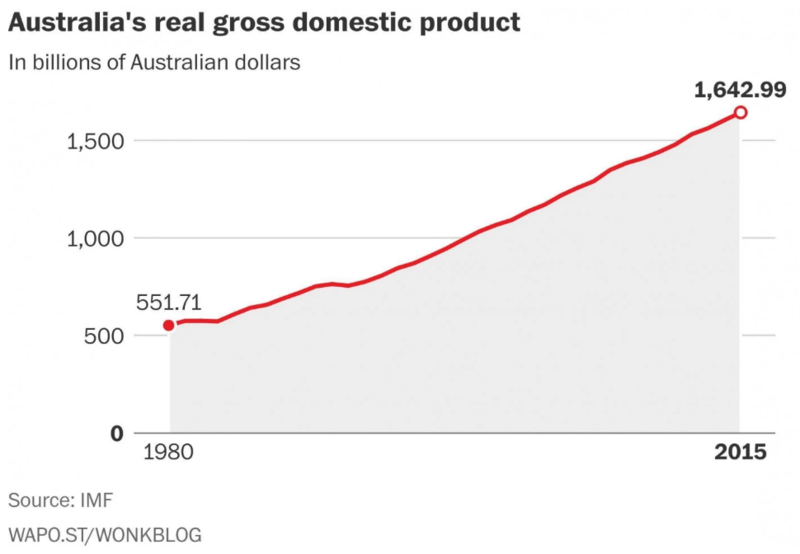 How has Australia been able to turn recessions into the economic equivalent of Beanie Babies — i.e., something we're happy to have left behind in the 1990s? Well, a big part of the story is China. More than anyone else, Australia has benefited from the innovative new model of digging things out of the ground and selling them to the country undergoing the greatest economic miracle in human history. Indeed, 32 percent of Australia's exports go to feeding what at one point seemed to be China's insatiable appetite for raw materials. That's a pretty good safety net for when things are looking shaky everywhere else. But only pretty good. For one, as economist Scott Sumner points out, Australia's exports actually fell quite a bit in 2009. So that can't be the reason it avoided a recession that was the worst since the 1930s for every other rich country. And for another, China has started to slow down itself the past few years. That, after all, is why Australia has shed mining jobs and seen its unemployment rate edge up since 2012. That its economy has kept growing, then, has been in spite of, and not because of, China. So what is it that has kept Australia's economy from shrinking? Well, the answer is as boring as it gets. It's that Australia has been able to cut interest rates when it has needed to. Other countries haven't, you see, because their interest rates are already as low as they can go at zero or even slightly negative territory. What's more interesting, though, is why Australia has been able to do this. And that's that it has a smarter central bank. Let's back up a minute. Twenty-five years ago, central banks began to take the actually revolutionary step of not only telling people what they were doing, but also what they were trying to do — that is, how much inflation they wanted in the economy. New Zealand was the first to do this, and, as Neil Irwin has explained, they basically pulled the number 2 percent out of thin air. At which point, economists quickly convinced themselves that this was wise. Two percent was a small enough number that it was pretty consistent with price stability, but it was large enough that interest rates shouldn't get stuck at zero. That, at least, is what they thought. As Paul Krugman points out, Federal Reserve economists estimated that rates would only be that low 5 percent of the time under a 2 percent inflation target. The reason that matters is that central banks can't do their jobs as well when interest rates are zero. Sure, the Fed can promise not to raise rates or even print money, but those things don't seem to be as effective as a good, old-fashioned rate cut. Which is to say that zero rates make it harder to fight a recession and harder to help a recovery. The problem, as we've found out after 8 years of near-zero interest rates, is that a 2 percent inflation target was not, in fact, sufficient to keep us out of this trap. That's because lower inflation means lower interest rates, and if interest rates are low enough when a big enough shock hits, then you'll find yourself at zero before you know it. That's what happened to Japan in the 1990s and to the United States and Europe in 2008 — but not, as we mentioned, to Australia. Why not? Because it doesn't have a 2 percent inflation target. It has a 2 to 3 percent inflation target averaged over the business cycle. Here's why those last five words matter so much. It's a question, as Bank of England Governor Mark Carney has put it, of whether central banks will allow bygones to be bygones. What do I mean by that? Well, imagine that inflation was just 1 percent this year. What would the Fed do the next? The same thing it does every year: try to keep inflation around 2 percent. If it under or overshoots that, it doesn't try to make up for it in the future — but Australia does. It's trying to get its high and low inflation to average out to 2 to 3 percent. That means mistakes aren't something it forgets but rather tries to fix. The result is that interest rates have been much higher in Australia than in almost any other rich country. This, of course, isn't a panacea. Those don't exist. Not even for Australia. After 8 years of the rest of the world dragging it down, its inflation and interest rates have finally fallen far enough that another shock might send them to zero. There's only so much better policy can do. The point, though, is that it is better. Fed officials have started to seriously talk about whether they need to increase their own inflation target, which wouldn't be that different from what Australia has now. There are worse things you could do than copy the country that hasn't had a recession since the time flannel was cool.